For an Experience of a Lifetime book lavish accommodation at Benguerra Lodge. The best part about the villas is their deep, copper bathtubs with sea views and the outside shower for a morning revive. Swing in your hammock to the sounds of birds in the forests around you. 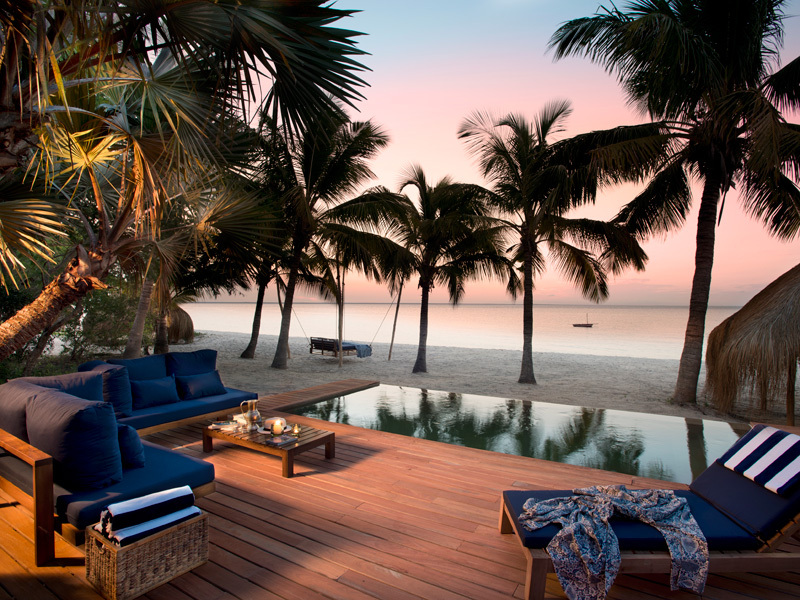 Sit on your private deck and cool off in your plunge pool or lounge under your thatched gazebo. Relax in a large lounge and spread out on king size beds – the chalets are decorated according to an African, Arabian theme that reminds you of pirates and shipwrecks, the romance of the islands long ago. Maybe you will see the rare dugong and hear tales of this mystical creature from the local people who still fish from traditional Dhows? Considering that Benguerra Island is only 55 square kilometers, and a national park sustaining a diverse population of wildlife and ecosystems including forest, savannah, and wetlands, your holiday in Mozambique at the newly revamped Benguerra Lodge will be well worth the effort in every way. We recommend this long stay special so that you get the most out of your Mozambique island holiday – in lavish accommodation of course! All the beach villas at this amazing Mozambique Lodge feature private lounges and eating areas, en-suite bathrooms with outside showers. And the incredible deep bathtubs in which you can soak up your breath-taking views. One of the main ethics at Benguerra Lodge is responsible eco-tourism. You too can become part of this holistic ethic. Only children aged 8 and upwards are able to enjoy Benguerra Lodge. We know that each one of them will leave this Mozambique island with memories of the turquoise sea, the white beaches, the many activities, and the wildlife around them – from the birds and monkeys to the whales, dolphins, turtles and many fish species. Do the right thing, book your lavish accommodation at Benguerra Lodge today.